Mechanism is a core research field in mechanical engineering, where diverse mechanisms are designed for mechanical components to achieve desired movements. Overconstrained linkage is a unique type of spatial mechanism, which does not comply with the Grübler-Kutzbach’s mobility criterion. It is mobile due to the geometric properties of joints connecting the links. It has been widely utilized in the field of aerospace engineering structures, mainly because of its structural stiffness, simple construction and reliability. Two construction methods for spatial overconstrained linkages were proposed. They were realized by removing common link-pair or common linkage in the jointed linkage assemblies. 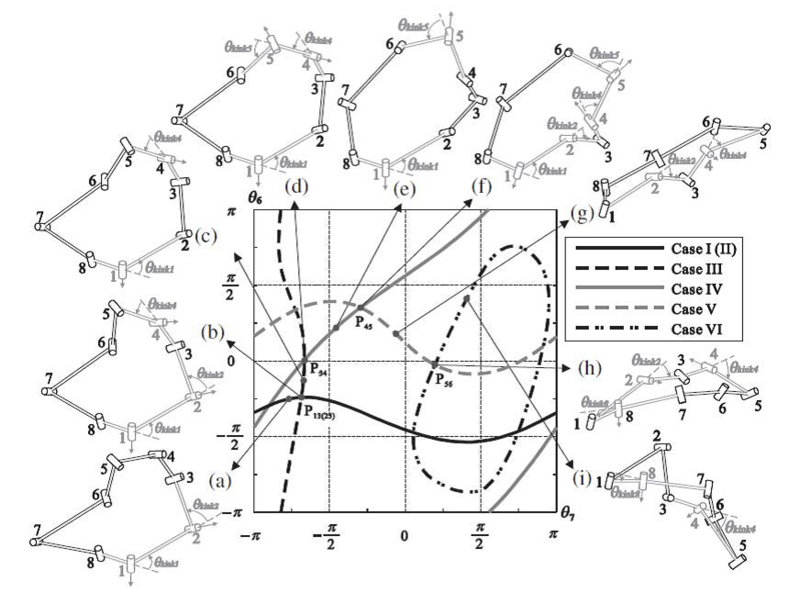 This then allowed us to invent new types of overconstrained linkages, including back-to-back double Goldberg linkages, extended Myard linkage and mixed double-Goldberg linkages. For example, the mixed double-Goldberg linkages was constructed by utilizing the combining of a subtractive Goldberg 5R linkage and a Goldberg 5R linkage, resulting in a new type of 1-DOF overconstrained 6R linkage. Based on the investigation of threefold-symmetric Bricard linkage, we proposed a variant configuration which was able to be fully-folded. The cross section of the links was selected as an equilateral triangle with the aim of achieving a bistable mechanism. Its kinematic behaviors and design parameters were systematically investigated, which enabled precise kinematic simulations. By considering bifurcation behavior and physical interference, we obtained the conditions for generating a smooth folding motion between end states. In addition, an analytical kinematics analysis method for line-symmetric Bricard linkage was proposed by using a matrix method. Two independent explicit solutions to closure equations of the linkage were derived, which corresponded to two closure forms that could not be transferred to each other. From the kinematic perspective, the line-symmetric octahedral Bricard was treated as a special case of line-symmetric Bricard linkage. Although it also had two forms in the closure equations, it was able to achieve both mechanism and structural closures unlike to others. These closure properties were analyzed under various geometric conditions. Bifurcation of line-symmetric and plane-symmetric Bricard linkages were comprehensively analyzed through a matrix method. Singular value decomposition theory was adopted to investigate singularity of spatial overconstrained linkages and the bifurcation point was determined by the rank of Jacobian matrix singular values. Numerous motion paths and bifurcation points of a line- and plane-symmetric Bricard linkages were detected, contributing to the discovery of bifurcation closure loop. 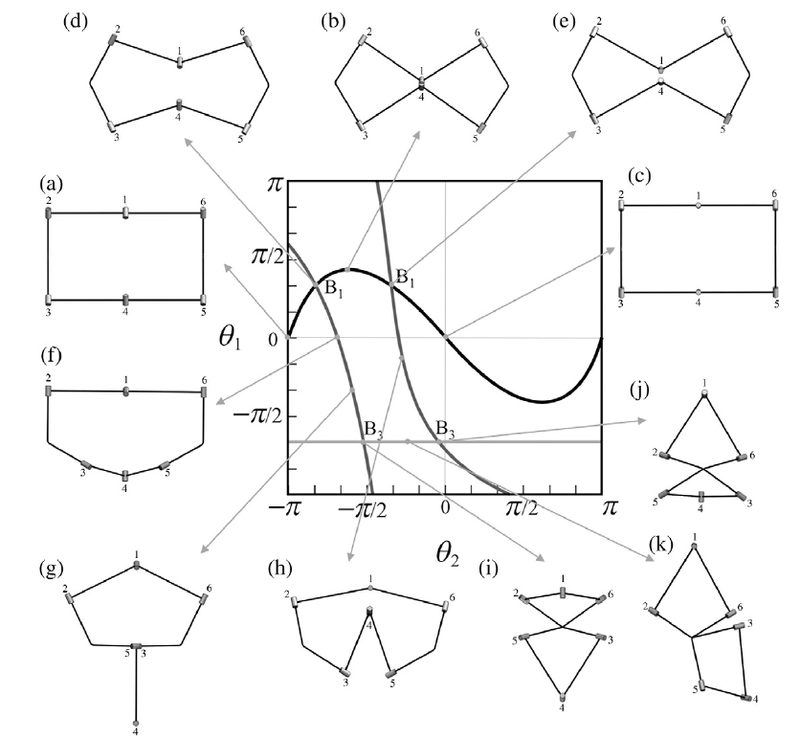 Furthermore, the complicated bifurcation behavior was analytically investigated and the corresponding geometric conditions were derived, which provided a theoretical foundation for the construction of reconfigurable mechanisms. Two construction methods for reconfiguration of spatial overconstrained linkages were proposed. They were realized by utilizing a bifurcation behavior or designing a new reconfigurable mechanism. A typical example of the latter method was the reconfigurable mechanism generated from a network of four Bennett linkages. 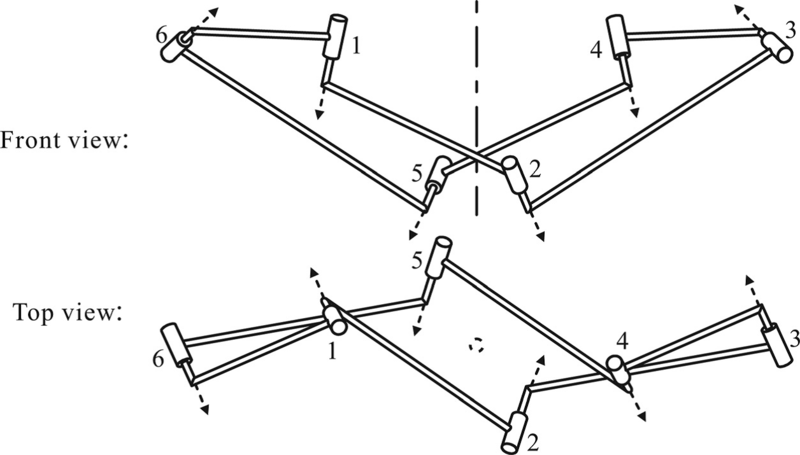 Reconfiguration among five Bennett-based overconstrained linkages were achieved by modifying the mobile joints, and the workspace was analyzed, which revealed the inner relationship of various Bennett-based overconstrained linkages. By combining theories of mechanisms and structural mechanics, the kinematic properties of spatial mechanisms were investigated including mobility, motion path and bifurcation behavior. 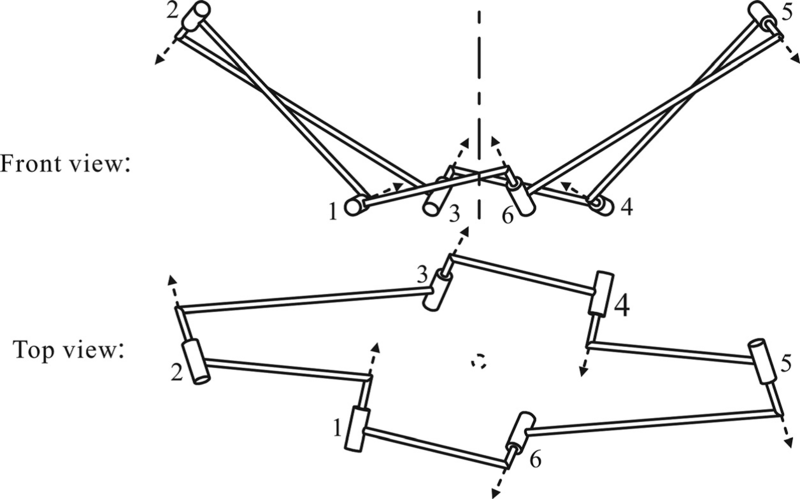 A general truss transformation method based on the equivalence between the spatial linkages and truss forms was proposed, which provided a new way to analyse the kinematic properties of mechanisms with complicated topology. We proposed a framework to obtain the non-overconstrained forms of its corresponding overconstrained linkages, which resolved the conflict between accuracy and compatibility in the assembly of mechanism, leading to a great potential for future applications in deployable structures.